The Scottish champions won 2-0 to continue their run but suffered another injury. Brendan Rodgers was not impressed by the crunching tackle on Emilio Izaguirre which saw the Celtic left-back carried up the tunnel on a stretcher near the end of the 2-0 win over Hibernian at Parkhead. The Hoops' squad was already stretched due mostly to injuries and in the 83rd minute, with the home side leading through a Ryan Christie strike and a deflected Oliver Burke shot, forward Vakoun Bayo was ready to make his debut. However, as the 22-year-old stood on the sidelines, Izaguirre was crocked by a fierce challenge by Hibs substitute Darnell Johnson, making his debut on loan from Leicester, who was booked by referee Craig Thomson. Bayo returned to the dugout and as Jonny Hayes came on, the Honduras international was carried up tunnel on a stretcher. 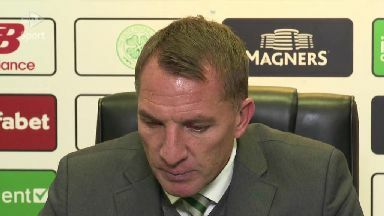 Rodgers said: "It was a clumsy challenge at best. "He is over on the ball, the boy, and I think it scared Emilio a little bit in terms of he has had issues with his ankles before when he has broken them. "But the medical team is telling me he thinks he has got away with it, it is a little bit sore and hopefully he will be okay in a few days." Asked if it deserved more than a yellow card, the Northern Irishman said: "I think Craig is a very good referee, he maybe didn't see it at the time, he was maybe blinded, but it wasn't a good challenge at all." Rangers' 4-2 win at Aberdeen meant leaders Celtic maintained their six-point lead over their Old Firm rivals. Rodgers said: "It was a very good controlled performance. "We scored a very good first goal. We could have been cleaner in our passes in the first half but the control was a lot better in the second half. "A very good three points for us." Hibs caretaker boss Eddie May, who will find out on Thursday if he will still be in charge for the William Hill Scottish Cup tie against Raith Rovers, did not think Johnson deserved a red card. He said: "No, because Scott Brown's (tackle on Mark Milligan) wasn't a red. "Craig seen it for what it was, just a mistimed tackle. But we are hoping his tackling is a wee bit better in the future."